Dale Power Solutions is one of the first companies in the UK to be awarded with the newly initiated Princess Royal Training. 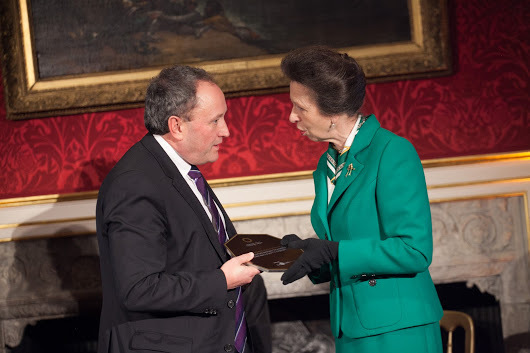 Dale Power Solutions is one of the first companies in the UK to be awarded with the newly initiated Princess Royal Training Award in recognition of their outstanding training and skills development programmes. Dale Power Solutions is celebrating with 33 other well-known and prestigious UK based businesses including Mercedes-Benz, National Grid and IBM UK Ltd. The City & Guilds Group launched the Awards in January 2016. They were developed in conjunction with employers, learning and development experts and assessors, and endorsed by the City & Guilds Group’s President, Her Royal Highness The Princess Royal. In total, 110 organisations applied for the Awards in their inaugural year. The Awards reflect the Group’s history of recognising achievement in training, as well its commitment to pioneering skills development. The successful organisations all demonstrated that training and skills development can make a significant impact on productivity and business success. Speaking about the winners, City & Guilds Group Chief Executive, Chris Jones said: “Excellence doesn’t happen by chance. In today’s uncertain economy, more than ever, employers must align investment in training to the objectives of their business. Whether they’ve addressed a skills gap, improved productivity or developed new leaders to grow their businesses, the awarded organisations deserve to be recognised for their achievements. All of the successful organisations deserve enormous praise. I hope these awards have shone a light on how important it is for businesses to invest in training to boost their productivity, address skills gaps and develop their leaders. This has never mattered more than in today’s uncertain economy. I hope this year’s winners inspire other organisations to share their experiences, and put forward their training and development success stories." Tim Wilkins, Chief Executive of Dale Power Solutions is thrilled to have won the award. “We are delighted to have been recognised by the Princess Royal Training Awards Commission for our training programme in particular our support of apprenticeships. It’s great to be part of the inaugural awards and for Dale to stand alongside other prestigious brands, including some of our customers, EE, National Grid, ISS. Our training programme goes very much hand in hand with our growth strategy and we know that by investing in our people we can continue to grow a healthy, successful and sustainable business. The award adds to a growing list of endorsements from national training bodies. In 2015, a team of Dale apprentices were crowned best in the country, coming joint-first in the National Brathay Apprenticeship Challenge Competition and the company has also been recognised by the National Apprentice Service and listed in the acclaimed Top 100 UK Apprenticeship Employers’ list, twice in the last four years. Dale Power Solutions has invested in a new building at its manufacturing facility in Scarborough.